Fig Rye and Beet-Cured Rockfish. Photo by Carri Thurman. Carri Thurman, baker and chef at Two Sisters Bakery in Homer, Alaska, on a young and growing cooks’ community. Her guest post speaks for itself (great links, too). —M.R. This summer I went completely and utterly MAD, and it couldn’t have been more rewarding or delicious. Mad is the Danish word for food. It is also the name of what has become one of the most exciting food conferences happening in the world today. This year’s talks were curated by David Chang and the folks at Lucky Peach magazine with the guidance of MAD founder, the head chef of Noma, Rene Redzepi. It is not so much a technical conference but a gathering of ideas and a convergence of philosophies with presentations that began with impassioned Italian butcher Dario Cecchini gutting a pig and quoting Dante and ended with Alex Atala showing us all that in cooking, as in life, death does indeed happen. The women of Souk el Tayeb and Danny Bowien and the chefs of Mission Chinese fed us lunch each day at the conference, Mikkeller Beer kept us hydrated and happy with their special brews for the occasion (the weed beer was a “high” light! ), and the coffees expertly curated by Tim Wendelboe were all memorable and amazing. As was the after party, a sit-down dinner for six hundred people under a bridge where I found myself nudged between fermentation god Sandor Katz and the soul of the South, Michael Twitty. The night ended dancing with Margot Henderson—that is, until the Danish police broke up the party. But the best part of the whole experience was eating all around Copenhagen. We booked reservations at many of the Noma alumni restaurants, such as Relae and Bror and, most memorable of all, Amass. We ate cod head and kohlrabi, lamb brains and eyeballs, and the most amazing foie “snow.” There was the incredible Chateaubriand covered in shaved truffles at Marchal and everywhere there were seasonal desserts of berries and verbena. 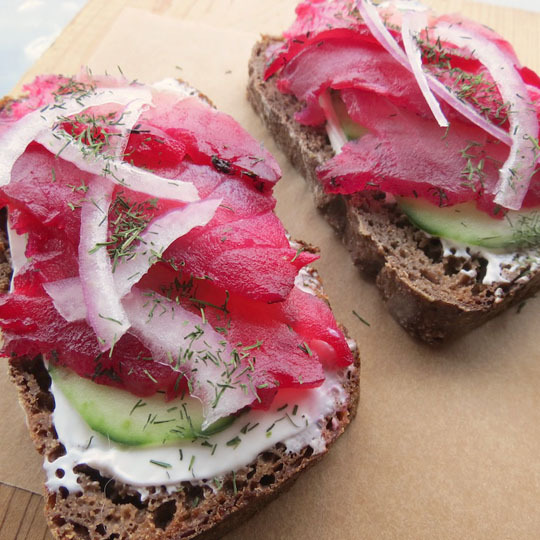 But the thing that stuck with me the most was the uber-hearty brown bread we tried one day at a sidewalk cafe; nubby and slightly sour, it was the perfect accompaniment for the traditional toppings of cultured cream and cured fish. The depth of flavor and variety of possibilities made it the one dish that translated the most perfect sense of place, right there by the water, the rigging on the boats ringing like a dinner bell as they bobbed up and down in the canal. It was the thing I most wanted to bring home and that felt most like home to me. So here is my tribute to all things delicious in Copenhagen, in honor of the summer I went Mad (and it was the best thing I could have ever done!). Combine the sugar and salt to make the gravlax cure. 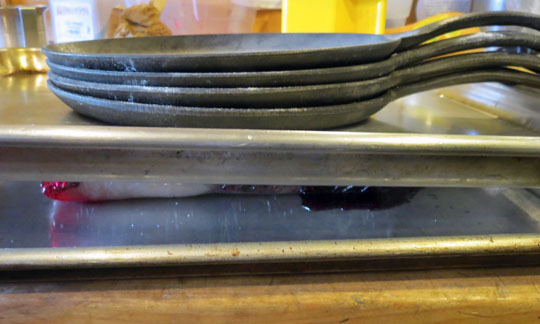 Sprinkle liberally over the rockfish fillets and lay them on a layer of plastic wrap. 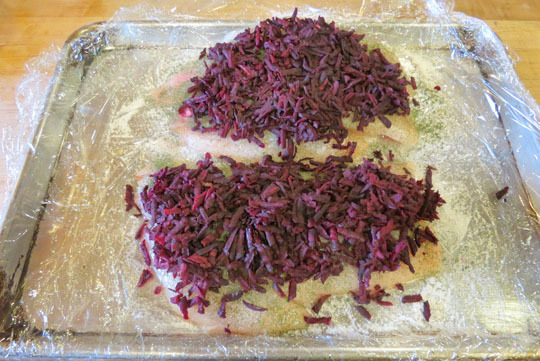 Scatter the grated raw beets over the fish. At this point you could also lay fresh dill down. Put the two pieces beet sides together and wrap very tightly in plastic wrap. Weigh the whole thing down and refrigerate for 48 hours, turning every 12 hours or so to distribute the fluids. Remove the beets, rinse the fish, pat dry, and slice thin. Serve as you desire! To store, keep wrapped tightly in the fridge for 1 week or in the freezer for 2 months. Stir 1 tablespoon toasted caraway seeds into 1 cup sour cream and refrigerate for at least 1 hour or overnight. Press through a sieve to remove the seeds. For a lighter cured version, serve as an appetizer with pickled onion and cucumber. Mix together in a medium bowl (it will be a stiff dough). Cover and let sit at room temperature for 8 hours. This is your rye starter. To this you will add the rest of the ingredients. When almost ready to mix final dough, rehydrate 8 ounces mission figs in 8 ounces of warm water and soak 1 cup thick cut oats in 8 ounces of warm water let both sit for 30 minutes. Puree the figs with their water in a food processor adding 1/4 cup of dutch processed cocoa powder, blend until you have a lump free paste. Pour 16 ounces of warm water over starter, add the figs and the oats and stir together well. mix in 16 ounces of rye flour and 1 tablespoon kosher salt. Stir together to form a rough ball in the center of the bowl. Cover and let sit 2 hours. The dough will have risen to about double in size. If not, it’s ok to let it go a little longer. Just remember this is a very dense bread with not a ton of rise. Pour out onto a well floured surface and using a knife or bench scraper, divide the dough into 3 equal parts. 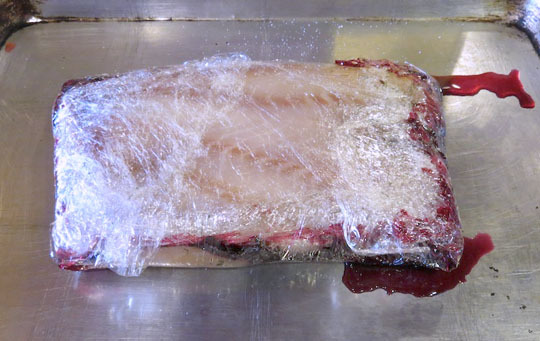 Cover with plastic wrap and let rise another 45 minutes to an hour. Bake in a preheated 325 degree F./163 degree C. oven for about an hour. You are looking for an internal temp of 200 degree F./93 degree C. Pull from the oven and let cool completely before pulling from the pan. 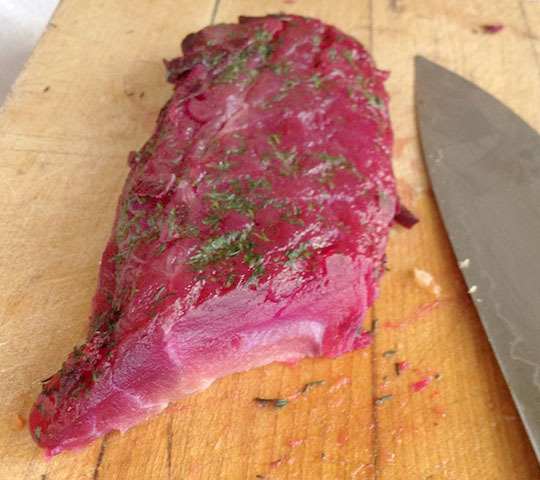 Wrap well and store at room temperature for about a week or lasts 3 months in the freezer. My past post on Rockfish Ceviche. Carri’s past posts include Magic of Making Salt and The Humanizing Impact of Soup. Try making the Citrus-Cured Salmon from Twenty. Roasted beet soup, an easy soup to make at home. I just thought of something to add about the fish. My fillets were frozen from the fall season. If you choose to use freshly caught fish, freeze them for 3 days either before or after you cure them, this will kill any potential parasites. Freezing fish for 3 days in a home freezer won’t kill off any potential parasites, as most home freezers don’t reach the suggested temperature (~-20 degrees C) to ensure parasites are inactive. It is sort of irresponsible to suggest that it would be fine. correction: It is sort of irresponsible to suggest the parasites will be dead. In many cases parasitic infection doesn’t result in serious illness, and a majority of people who’ve eaten raw preparations of fin fish will have consumed parasites with no ill effects. Just stay away from raw fresh water fish and be wary of salmon. I appreciate your taking the time to clarify. Thanks for that clarification AND the clarification of your clarification! As with consuming any raw seafood, there’s always a certain amount of risk involved. The integrity of the purveyor of seafood is obviously of utmost importance, and if you understand that, along with proper handling, I personally don’t see an issue. I’m willing to take that chance. I wouldn’t, however, use anything but fresh fish for this preparation. 1. In step A, you use 16 oz. of water and of flour, but then add those amounts again in step D. Is this right? So there are 32 oz total of each in the recipe (not including what’s already in the starter)? 2. Is the oat-soaking water to be included in the dough? Thanks for running this blog. I’ve used it and your books a lot, and have become a big fan. No Michael, sorry there has been a kerfluffle in the writing of this recipe! I will get proper steps to Emilia ASAP! what kinda fish could be a substitute? rockfish is not particularly local to me, and I try to avoid eating fish that might be older than I am (i.e. maybe not the most sustainable food source for mass consumption). Ruhlman……that is just pure foodporn! Damn you! I say damn you!!! Now, I got to duplicate that…or attempt to.